The best way to learn a skill is with practical training. At All Star Safety Training, we help get people get ready in the industrial sector. If you are pursuing a career as a forklift operator in Upland, CA, visit our facility and get the proper certification--we're here to help you get on the right track. From vehicle operation to CPR and first aid training, you will gain the skills you need for a competitive workforce. Make a difference and enroll today. For years, our instructors have been providing in-depth CPR and first aid classes for your employees and the public at our training center. Everything we do is backed by more than 38 years of combined experience. By applying a hands-on approach to education and training, we are helping people respond to crises with confidence. Contact us to book your spot in any of our forklift, first aid, or CPR training classes. Make no mistake: while being on a job site is an integral component of any routine, it is also important to remain vigilant. Knowing what to do in an emergency can make all the difference, and learning what to do only takes a few hours. All in all, taking first aid classes amounts to time well spent--especially when lives are on the line. When you know what to do, you are already an indispensable member of your team. Our certified instructors have years of experience, giving you the best training possible. By using a combination of lectures, videos, group discussions, and hands-on activities, you gain the tools to demonstrate emergency and first aid techniques at the workplace. Leaders can help their teammates grow and succeed when they enroll in group classes. Our forklift, CPR, and first aid courses are all available as a group, with participant minimums and pricing at lower rates than our competition. Thanks to our measured and in-depth approach to training and certification, all participants learn the right skills in a close-knit environment. In turn, enrollees are able to contribute to one another's success: a true demonstration of teambuilding and professional development. Save money and learn with us. The cost for one of our forklift training classes starts as low as $50 per person. Other companies charge up to $100 per person and require a minimum of 10 people per forklift certification class. We require a minimum of only eight people per class to help you save even more money. Please don't think lower cost means lower quality training. We believe that quality is never an accident. It is always the result of intelligent effort. Getting results with practical training is what All Star promises each and every client. 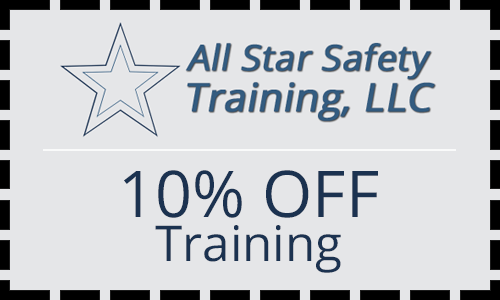 All Star Safety Training will provide the training your company needs to meet government safety standards, minimizing the likelihood of incurring OSHA fines and penalties. We provide all the documentation you need, including the attendance sheets, written exams, performance evaluations, and employee training acknowledgment forms for our forklift certification programs. 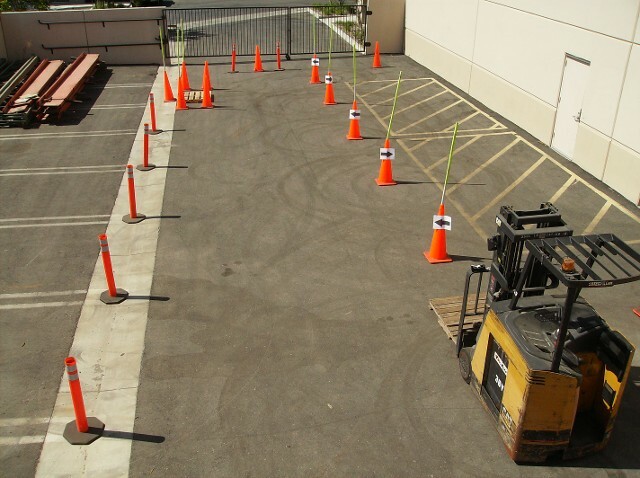 Contact us to learn more about our on-site forklift safety and operator training and other courses. We are located Upland, CA, and we serve professionals throughout Central and Southern California. For pricing details, service timelines, or any other questions you have, contact us through the form.